The Capital Improvement Project (CIP) encompassed several components. 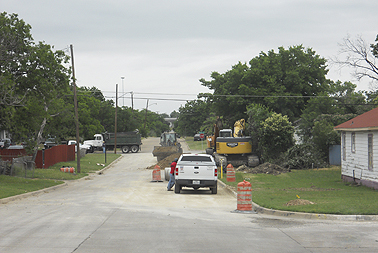 MULTATECH was responsible for the design of three residential streets located in west Fort Worth. 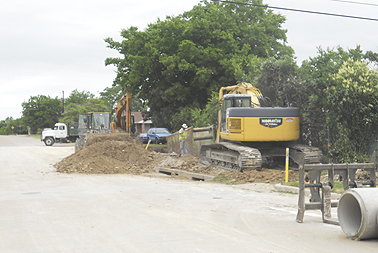 Design services provided included 2,000 linear feet of 28 to 36 feet wide concrete roadways and 2,000 linear feet of 8 inch waterline and 700 linear feet of storm drain improvements. MULTATECH's scope involved full construction plans including paving, drainage, water, sewer, roadway cross sections, technical specifications, assistance with bidding, public meeting and pre-construction meeting. The challenges for MULTATECH during this project were the drainage improvements for Wellesley Street because design constraints included a shallow mid-block lowpoint between Bourne Avenue and Hervie Street and an existing 30 inch water line was required to stay in place in Wellesley. The nearest existing storm system was located in Bourne Street, a concrete paved street, two blocks north of Wellesley. With these constraints, a mid-block lowpoint was designed in Wellesley with one inlet, providing a transverse pavement section toward the new inlet to clear the existing 30 inch concrete water line, and selecting a storm drain route within Bourne Street parkway, keeping Bourne Street concrete paving intact. The selected route also cleared two 6 inch gas lines parallel to the proposed storm system.